Child abuse comes in many forms and includes physical, verbal and emotional abuse as well as neglect. According to the Child Welfare Information Gateway (CWIG), prevention is key to reducing child abuse and neglect. However, prevention only happens when individuals and communities come together to identify at-risk kids and offer prevention education and initiatives. According to Joelle Casteix, author of The Well-Armored Child: A Parents Guide to Preventing Sexual Abuse, children "fall through the cracks" for many reasons but not because their parents are bad or they come from poor socio-economic backgrounds. She says the key is ". . .to give your child the tools so that he/she is not an easy target." She adds, "You know your child better than anyone. If you are concerned, ask your child and get help." Casteix advocates that communication is the number one obstacle in the fight against child abuse. "We don't give our children the language to have power over their bodies. Casteix believes parents should teach their kids the proper biological names of body parts at an early age. "We need to give our children the language and the ability to tell an adult "no" when that adult wants to touch our child or asks the child to touch them." Bath time and bedtime present good opportunities to have these conversations because kids are less distracted. Let children know it's their right to feel safe and be treated well. Children who understand abuse is wrong may be more inclined to report it. 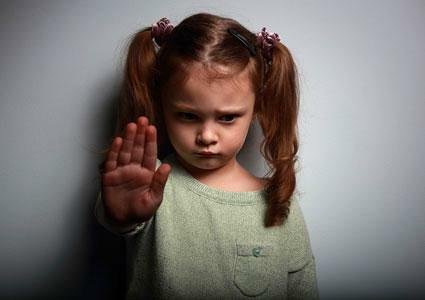 Teach your kids they can say no anytime anyone asks them to do something embarrassing, painful, or uncomfortable. Role-play the appropriate way to handle specific situations such as saying "no" when someone is tickling them, or if an adult asks them to sit on his lap and they don't want to. Likewise, never force your child to show affection to an adult, even an adult they love. "When you force children to hug or kiss an adult, you are telling your children they do not have power over their bodies with people they love," Casteix said. Predatory grooming includes giving gifts and using flattery and attention to trick kids into confusing abuse with love. "This is how an adult finds and creates a "compliant" victim, that is, a victim who is too scared and manipulated to report," Casteix said. Teach kids that abusers are often people they trust. Learn to recognize signs of abuse such as depression, fear of specific adults, a change in eating or sleeping habits, poor hygiene, secrecy, and excessive anger and hostility. "Predators can groom children just as easily over the Internet as they can in person," Casteix said. She suggests parents make a "no cell phones in bathrooms" rule and make it clear to their kids, their peers, and the adults in their lives that everything is monitored. This puts predators on notice. Carefully consider who your child spends time alone with, including adults and older children. Be an example by avoiding one-on-one time alone with other people's kids. Advocate for school, youth, and faith programs that eliminate situations in which an adult is alone with a child. "[Sexual] predators love telling children secrets and making the abuse a "loving secret" between themselves and their victims," said Casteix. She suggests being open with your kids and teaching them to come to you if anyone wants them to keep a secret. Prevent Child Abuse America and the Washington State Department of Social and Health Services offer several tips to build nurturing, loving relationships with your children. Kids aren't the only ones who need a time out. If you're angry or stressed out, you may take your anger out on your kids. Find something that helps you decompress such as listening to music, journaling, coloring, or going to a quiet room for a few minutes (but only if it's safe to leave your kids alone). Never punish or discipline your children while you are angry or upset. Abusers use anger and fear to gain control instead of using discipline as a teaching opportunity. Link privileges such as playing video games or television time to good behavior. Set clear consequences for bad behavior ahead of time and follow-through consistently. Verbal child abuse and neglect can be as devastating as physical abuse. According to a Florida State University study, kids who are verbally abused are at an increased risk to become self-critical adults prone to adult anxiety and depression. Consider how you speak to your child and recognize that words and isolation can be harmful. If you spew hateful words, leave the room and count to ten or take an extended time out. Demonstrate that problems can be solved without violence or verbal abuse. According to the University of Nebraska-Lincoln, you can be a positive role model by practicing good manners and respect for others in front of your child. Do not send mixed messages to your kids. For example, do not teach your child not to physically or verbally abuse others and then punish them by spanking or cursing at them. Your anger escalates and you cannot stop yourself from hitting your child multiple times, screaming louder and louder, or throwing your child. You feel disconnected from your child. You struggle to take care of your child's daily needs. Other people are taking notice and suggesting you've crossed the line. If you meet any these criteria, get professional help. Although you may be ashamed of your behavior, you need to break the abuse cycle. Contact the National Child Abuse Hotline (1-800-4-A-CHILD), a trusted adult or clergy member, or your doctor. Parenting classes, psychotherapy, and abuse support groups can help. In addition to the National Child Abuse Hotline, other resources are available which support child abuse prevention. CASA: CASA (court-appointed special advocate) volunteers advocate for abused and neglected children and help them find loving, safe, and permanent homes. You can get involved by volunteering or donating. U.S. Department of Health and Human Services tip sheets and activity calendars: Use these tip sheets to learn to manage stress and deal with common behavioral issues with children. Activity calendars are also available for parents and communities to foster well-being in children and promote parent-child bonding. The calendars were created for National Child Abuse Prevention month (2015) but the ideas can be used anytime. Prevention Programs: CWIG provides prevention resources including state program reports, parent support groups, respite care, and preventing the recurrence of abuse and neglect. Find a Therapist: If you need a psychologist, the American Psychological Association website allows you to search by zip code, city, state, and area of specialization. The Child Welfare League of America: This organization offers family and community support, training, conferences, e-learning opportunities and webinars. They also offer three magazines that deal with child welfare. Healthy Families America: This organization is a home-based visiting program that works with overburdened families at risk of child mistreatment. No child should endure abuse of any kind. Children look to the adults in their lives to keep them safe and well-cared for, yet far too often this doesn't happen. The first step to preventing child abuse is educating yourself on how to recognize it and taking steps in your home to prevent it. Stay alert for signs of abuse and be engaged in your children's lives and the lives of other kids you spend time with. Caring adults are a child's first line of defense against abuse.